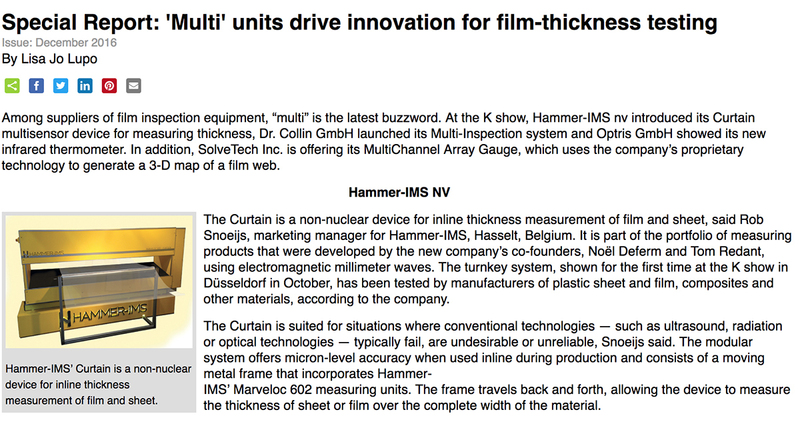 Plastics Machinery Magazine (US) published Hammer-IMS CURTAIN solution in special report on innovative ‘multi’ units for film thickness testing. Among suppliers of film inspection equipment, “multi” is the latest buzzword. At the K show in Düsseldorf, Hammer-IMS introduced its CURTAIN multisensor device for measuring thickness. Click here to read the Plastics Machinery Magazine publication. The Curtain is a non-nuclear device for inline thickness measurement of film and sheet, said Rob Snoeijs, marketing manager for Hammer-IMS, Hasselt, Belgium. It is part of the portfolio of measuring products that were developed by the new company’s co-founders, Noël Deferm and Tom Redant, using electromagnetic millimeter waves. The turnkey system, shown for the first time at the K show in Düsseldorf in October, has been tested by manufacturers of plastic sheet and film, composites and other materials, according to the company. The Curtain is suited for situations where conventional technologies — such as ultrasound, radiation or optical technologies — typically fail, are undesirable or unreliable, Snoeijs said. The modular system offers micron-level accuracy when used inline during production and consists of a moving metal frame that incorporates Hammer- IMS’ Marveloc 602 measuring units. The frame travels back and forth, allowing the device to measure the thickness of sheet or film over the complete width of the material. “Its multisensor approach is a clear differentiator compared to conventional methods,” Snoeijs said. “Plastic sheet and film manufacturers can decide on the length of the Curtain frame and the number of integrated measuring units. This way, the solution supports high-width production and situations where quick feedback is required.” Additionally, the system measures the thickness deviation over the entire width of the sheet or film, allowing it to detect different types of production flaws. The contactless device is suited for quality-assurance applications, including measurement of plastic sheet used in the construction market and combined thickness and basis-weight measurement of extruded foam sheet. It can be used with a variety of materials, including PE, PP, PET, acrylic and PC. “It is applicable in high-temperature conditions close to the extrusion die for quick feedback, thereby reducing material waste” and cutting overall operating costs, Snoeijs said.